On Pingala, magic is king. Literally. King, or Queen, depending on which of the six species you belong to. But magic only extends so far. Within 10 miles of the location of his or her Royal Highness, to be exact. The Royal Circle, this area is called. All the magic-dependent species – human, Aridizan, Byndari, Flyer, Katipo and Nasuchu – find the Royal Circle limiting and frustrating. But all that’s about change. At the next solar eclipse, the Kings and Queens, together, can perform a ceremony to spread access to magic power across the whole planet. But there’s a problem. 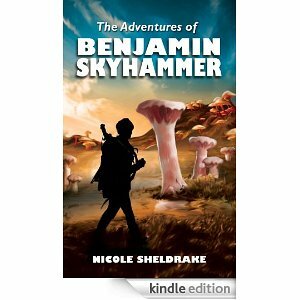 For nineteen-year-old Benjamin Skyhammer, a rare human born without magic power, the threats are a particular problem. First of all, the ceremony would give him the magic powers he’s wanted all his life so he can finally be accepted by human society. Second, Skyhammer is the Keeper of the Retrograph Vault, the only human known to be able to see other people’s Retrographs. This entry was posted in Adventure, fantasy, July 2011, Middle Grade/Young Adult, mystery. Bookmark the permalink.